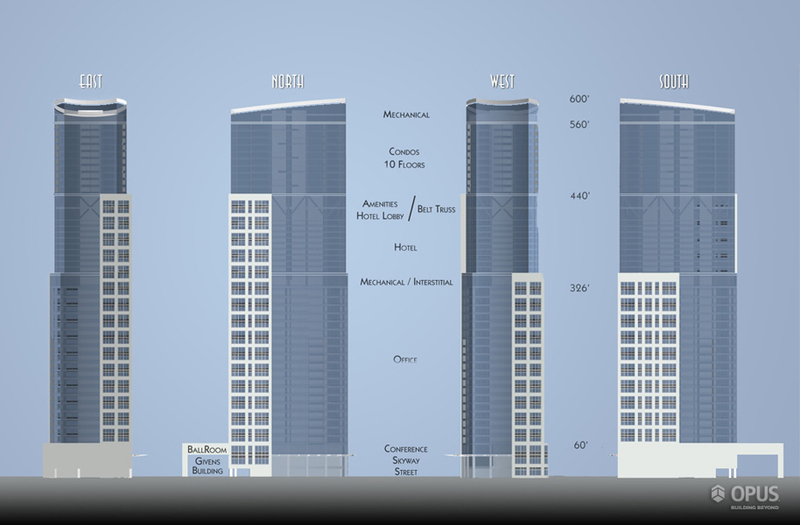 A proposed 500' high rise that would provide true mixed use occupancy beyond just the first 2 levels. 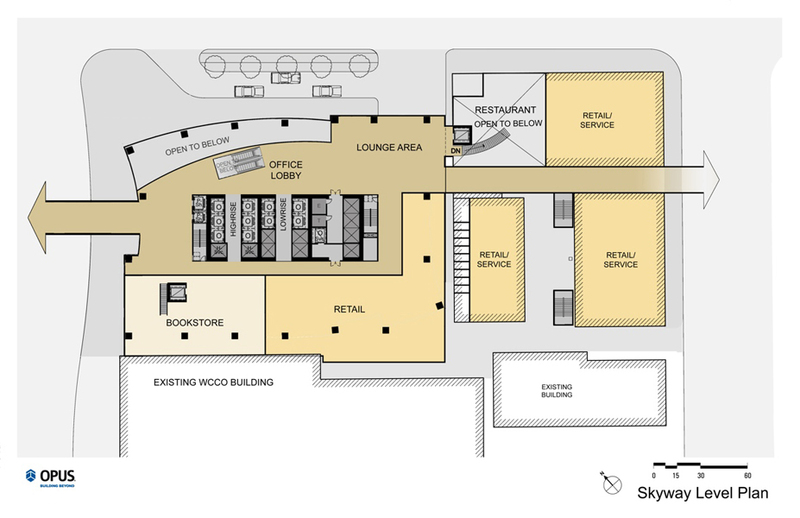 The design captures the essence of the pedestrian mall it occupies, in the form of gentle concave and convex curves. 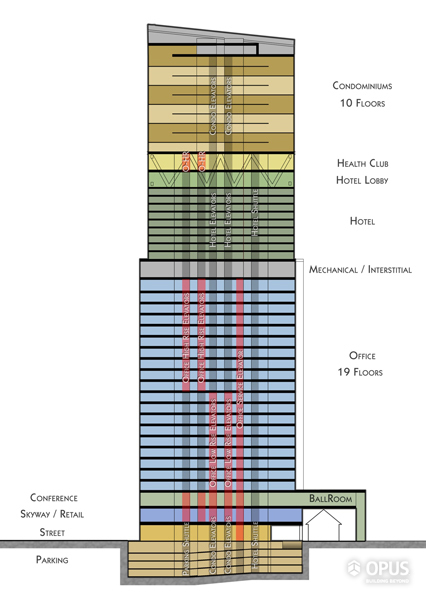 As with many modern high rises, this tower strives to find a balance not only in its place in the skyline, but of occupancy types as well. 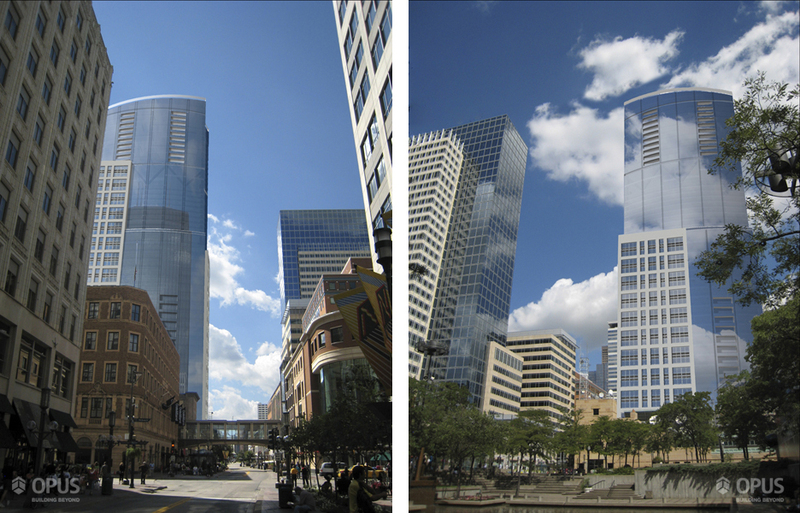 Including hotel, office, and luxury condos within a form that has an adapted floor plate for each need, 10th and Nicollet strove to maintain a cohesive form. My design was the final selection from an in house competition for 4 proposals. It certainly wasn't the most adventurous of the options. Many of the alternates from our designers were bold and daring. However I think mine was selected because the marketplace of Minneapolis was perceived to be more open to a subtle beauty with a midwest pragmatism (in other words, vanilla ice-cream with a ribbon of fudge running through it). In the end, the market was soft for any proposal, which prevented the project from moving farther than late early design development. 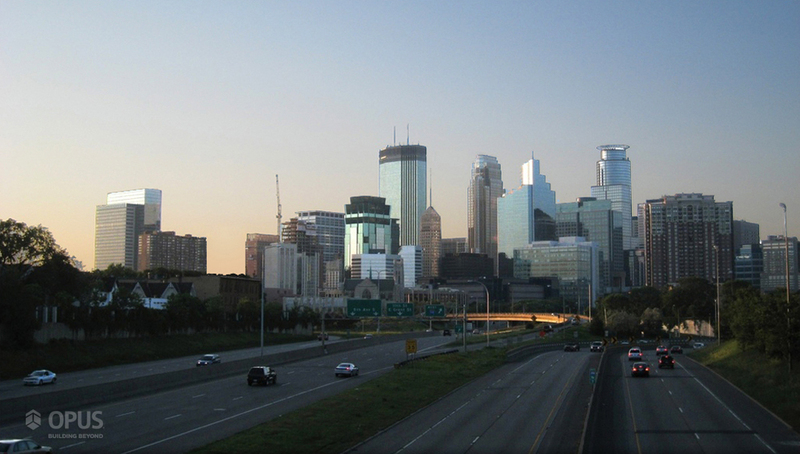 It remains indelibly in my mind when I look at the Minneapolis Skyline, constantly evolving and morphing. While this design became the preferred choice, my role early in this process felt more like coordinator rather than designer. My title in the department up to that point was as an “intern architect”. As such my role really focused on supporting the design process rather than leading it. So in the beginning, my primary responsibility was to coordinate the presentation efforts of the designers rather than to focus on my own work. This coordination came from the fact that each of us had certain varying levels of skills and methodologies. Part of my role was to put each project into a similar format so that each could be based more on the merits of the design, rather than the presentation style. It’s important to note that not everyone on the team agreed with this approach and looking back on this experience, I can understand why. Certainly one presentation method, may in essence and favor one approach to design over another. 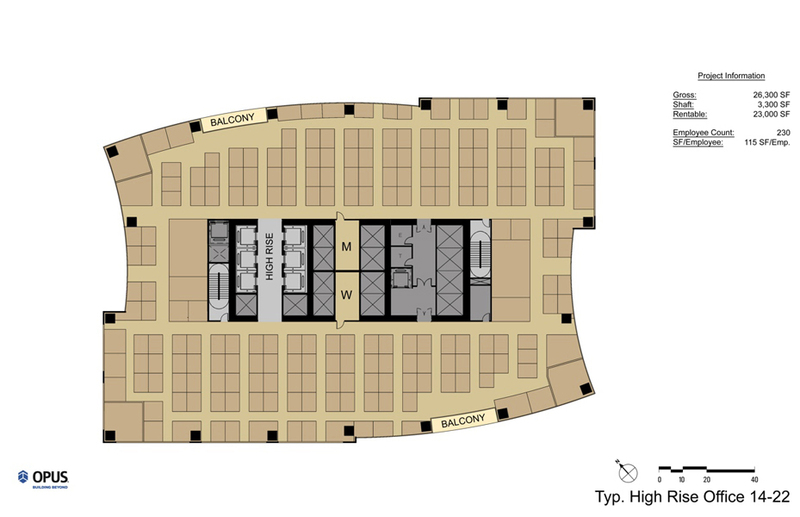 SketchUp had been selected as the de facto medium for modeling and presentation. We combined each building design into a single site model for discussion. Additional background materials and renderings were presented as a slide show from “Front Row” on a MacBookPro. In regards to my own design approach for this project really came from a combination of approaches learned while at Opus. Simplicity & elegance of form, and letting a parti drive my decisions. 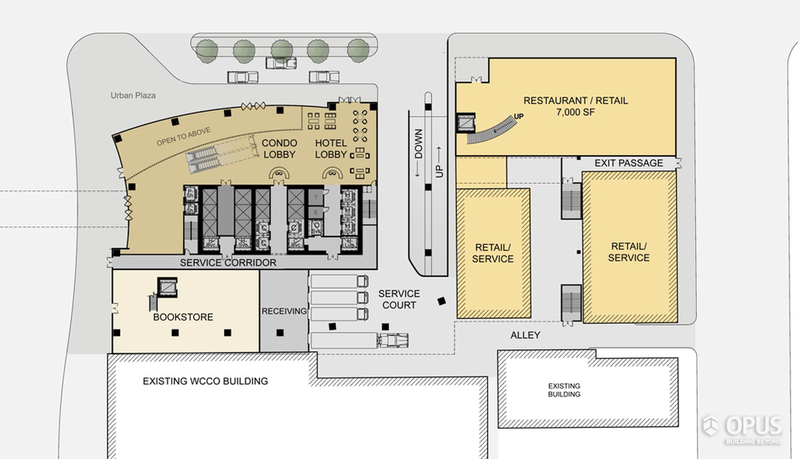 To derive a form and vernacular from the pedestrian mall which it inhabits. The culture of the city and moreover the street was a the dominate character of this project. This Pedestrian/Bus mall is unique part of this city and it’s curvilinear nature is widely appreciated only when looked down upon from the sky. This is the result of each block becoming only one component of this curve. By expressing this series of convex and concave curves in form the the building would emphasize each other’s presence. It’s curious to note that in most cities skylines, that unless you know what building you’re looking at in a skyline, it’s hard to really get a feel for where it is, once your in the core of down town. I hoped that by carrying the form of the street into the sky, it would be a small clue as to it’s unique location. The form of a curve, in imagery is seldom appreciated as a curve so it’s difficult to express at a distance without using photo-realistic modeling techniques in an animation. However, one can imagine driving on approach to the skyline and feeling the buildings movement of reflected light and subtle change of form. 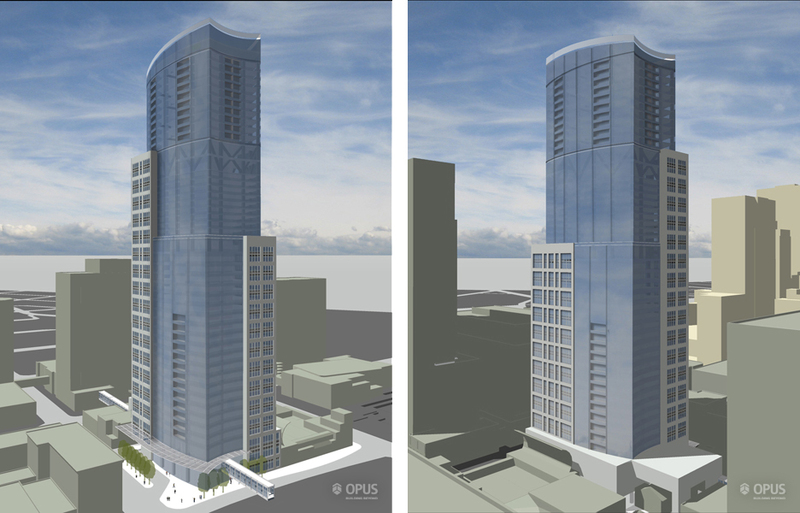 I would have put that theory to the test, but the regional economic conditions thwarted this project from moving beyond early design development in my time with Opus A&E.